TherapySafetyNet is designed to meet the mental health needs of individuals who would otherwise fall through the cracks. Millions of Americans do not have employer-sponsored health insurance, yet do not qualify for publicly-funded programs such as Medicare or Medicaid. Examples include temporary workers, part-time workers, unemployed or self-employed individuals, and people whose employers choose not to provide health insurance coverage. 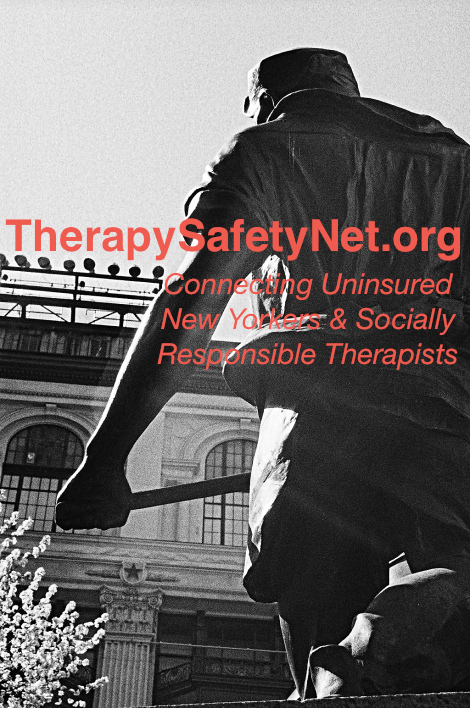 TherapySafetyNet is an informal coalition of psychologists and social workers in the five boroughs of New York City who each agree to work with a limited number of uninsured clients at a reduced fee. Each of our professional network members is pre-screened, qualified, and committed to social responsibility, including caring for those workers who lack insurance coverage for mental health. TherapySafetyNet was conceived by Dr. Geoffrey Steinberg, a psychologist in private practice in Manhattan. TherapySafetyNet is not a mental health agency and does not provide mental health services. Each licensed psychologist and social worker affiliated with TherapySafetyNet is required to carry professional liability coverage, and is individually responsible for the treatment of any referrals they may receive through TherapySafetyNet.